OK, that was the impression the instructor had (of me) when he saw my blog and that I just went for a Manicure at Bellis Nails. But Ahyo, that was like my first official sponsored manicure and I’m being stereotype liao! He was even afraid my manicure will be spoilt when I wear the gloves. I was like -.- That was the last thing I would have been worried about! So before I continue my ramble, here’s photos I took of Zen Martial Arts! You might be thinking, HUH? Putting on gloves also need to learn? But do you know in the boxing glove, there is actually a wire grip for you to hold on to? The first thing we are taught was: how to hold a fist. How to make a fist is one of the first things taught in karate, kung fu, taekwondo, or any art that includes punching or striking. 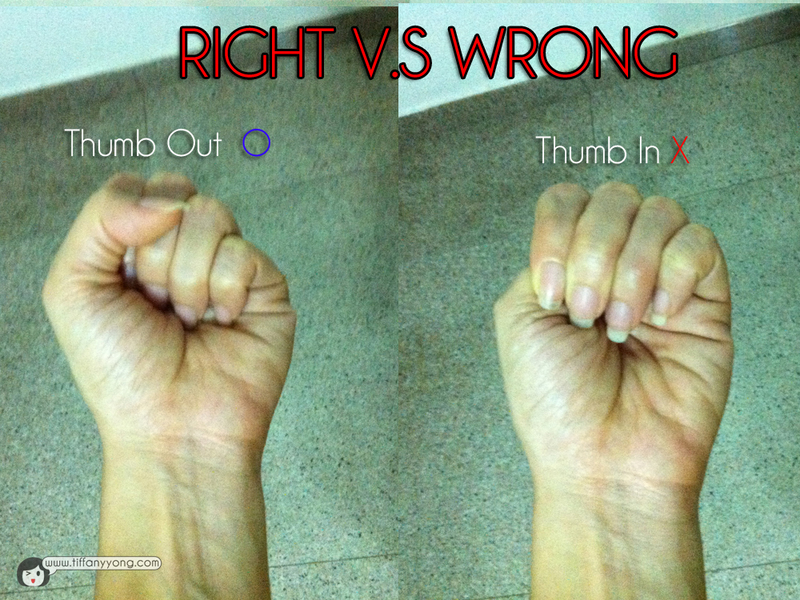 Because, if you put your thumb inside when punching someone, there’s a higher chance of you breaking your own thumb! 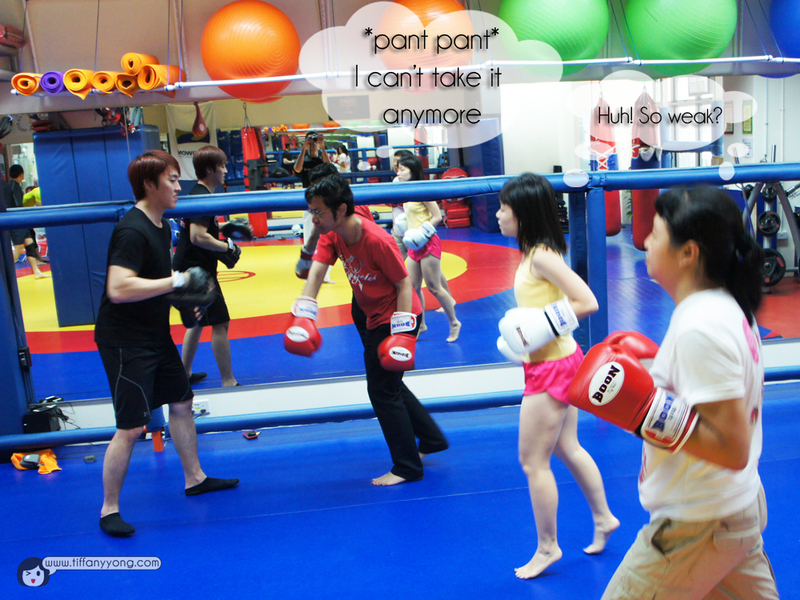 According to the instructor, girls have the tendency to punch the wrong way, with their wrist angled. And they usually end up with two results: (1) A not-so-painful punch (2) A broken wrist. 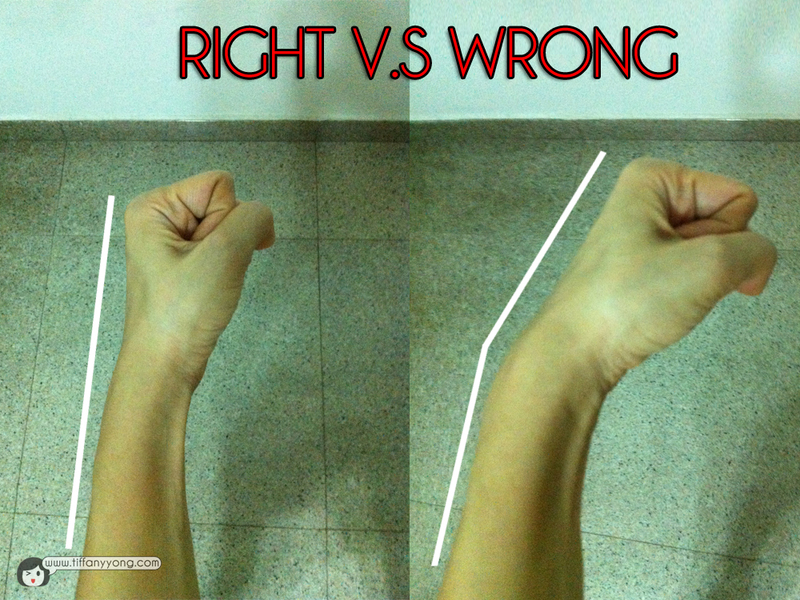 Because our force and strength comes from the shoulders/arms, so if we don’t punch with a straight wrist, it might bend more and crack! there goes the wrist! Ok, Let’s Try this out! Zen Routines to train your whole body! Besides the basics, we were taught routines that sounds easy, seems easy but IT IS NOT EASY AT ALL! I was half dead by the end of the 45min lesson! Jumping Jacks, Box box and crunches! So the instructor gave us 2 sets of routines, one is to do jumping jacks on the spot while everyone take turns to run towards him and throw him punches. Like very easy right? BUT the gloves are like weights after a while. And for a person like me who don’t exercise regularly, I was in stitches after the 4th round. The second set was to do crunches while he go to us to throw punches. I was happy for 1 minute (FINALLY no need to run!) But after the 3rd round, we were like, can I don’t get up? What Else Do Zen MArtial & Fitness Provide? 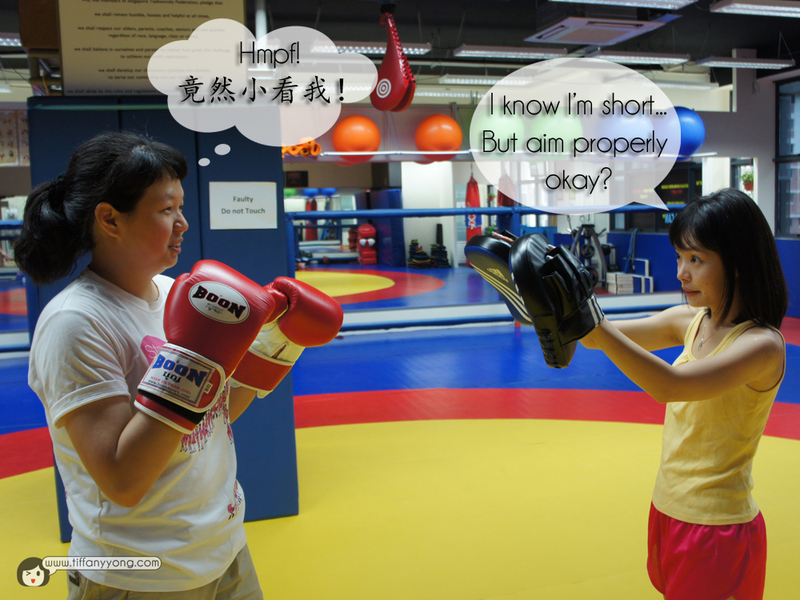 Besides the Boxing lessons we had, Zen Martial & Fitness also provide the following lessons! Taekwondo is the core Martial Art/Sport that is taught in ZEN Martial Arts and Fitness under strict supervision and and guidance. In Korean, Taekwondo means the way of Foot and Fist. 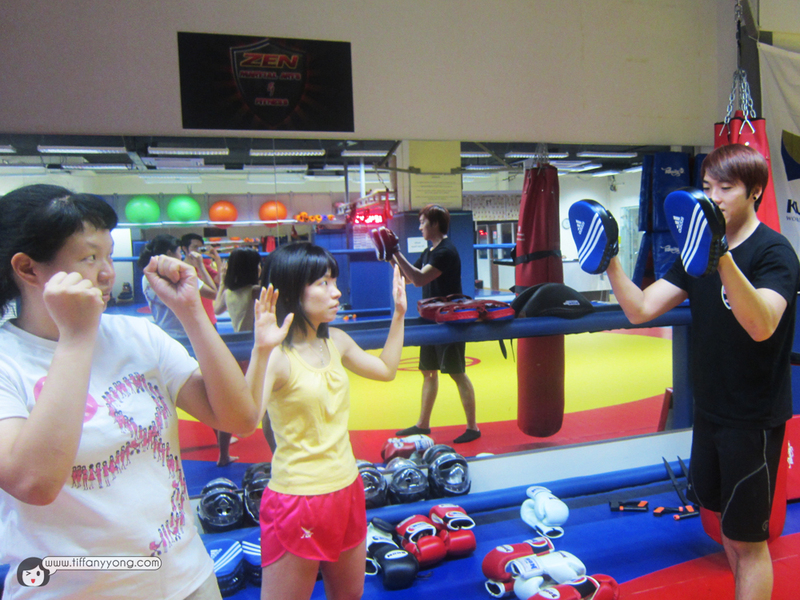 The classes provided consist mainly of Poomsae (Pattern) and Kyorugi (Sparring). During sparring, students are required to wear 7 kinds of protective gear which makes Taekwondo the safest Martial Arts sport to learn. Our classes include a 30min Burnout Training, Suspension training, FIT Box Training, Cross Training for the IPPT Specific, Cross Training (without IPPT Specific) , Kids Fitness, Ladies Aerobics, Padma & Therapy Yoga, Loopz Fitness and Kids Yoga. Krav Maga is the official self defense and fighting system used by the Israeli Defense Forces (I.D.F. ), Israeli Police and Security Services, and numerous U.S. law enforcement agencies. Developed and refined during years of conflict, Krav Maga have been battle-tested in real, life threatening confrontations. The Krav Maga system was created with great importance placed on bringing students to a high level of skill in a relatively short period of time. It is considered to be a modern, highly refined, street fighting system, designed to be utilized against muggings, street attacks, and sexual assaults. Freestyle wrestling is an Olympic sport for both men and women. ZEN students will learn takedowns and throwing techniques as well as pins and tilts. Wrestling is probably the toughest sport to train as in demands a complete body workout. Wrestling in ZEN will develop a sense of ethic, resilience and responsibility. Focus on clinch & ground fighting with the aim of obtaining a submission using holds. Pekiti-Tirsia Kali is a close quarters, in-fighting system of combat based on tactics and strategies derived from Edged Weapon Awareness. Because the nature of warfare involves the use of weapons skill development. The weapons are trained first to develop proper movements and body mechanics, to increase intensity in training, and to condition constant awareness. The weapon categories of the system include edged and impact weapons of various lengths, flexible weapons and firearms. Designed for both single and multiple attackers, Pekiti-Tirsia is a complete system with both weapons and empty hands methods. These methods include – Pangamut, involving striking, guiding and immobilizing with the hands and arms; Sikaran, which incorporates kicking and leg clearing; Dumog, which uses takedowns, breaks and ground-fighting. 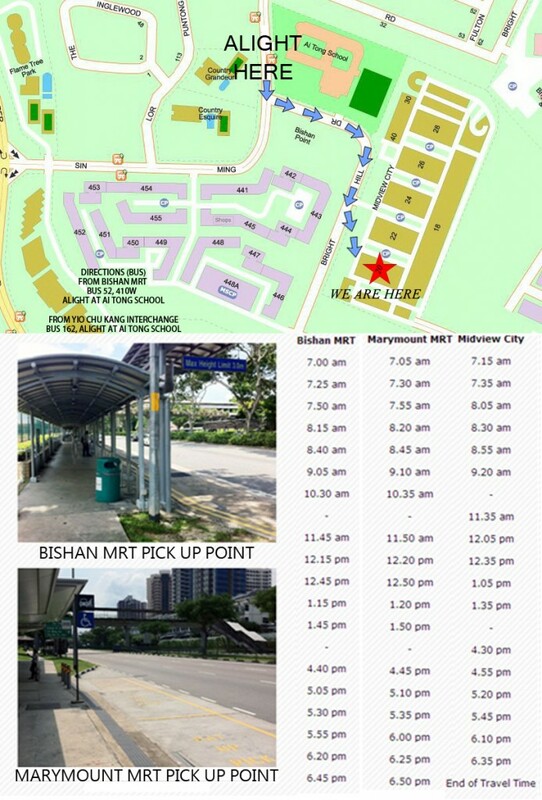 They are located near Marymount MRT Station and Bishan MRT Station, yes, quite ulu, but it’s definitely worth the trip and lesson! So do contact them for their lesson plan! Event invitation from streetdirectory. No monetary compensation was received for the review.